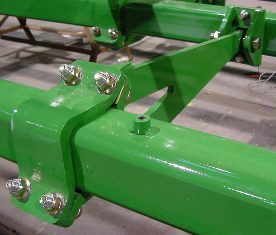 Robust ball joints connect strong fore-aft tubes to 100-mm x 100-mm (4-in. x 4-in.) 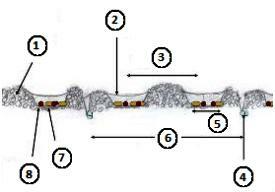 rank tubes, which are joined to one another by pivoting rank connectors. Both the mainframe and wing sections share this durable construction that enables the frame to flex diagonally, relieving stress on solid frame members and avoiding frame failures. Seed smart with confidence that the 1830 and 1835 will endure the field conditions. 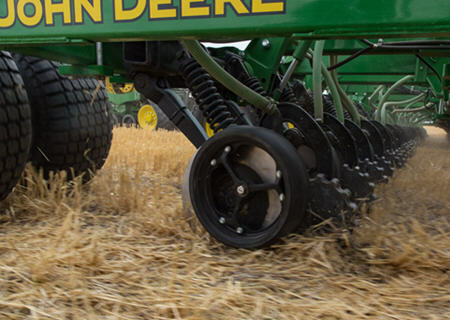 Setting depth is one of the most critical adjustments an operator will make to a seeding tool. 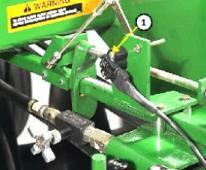 John Deere understands every operator needs dependable, repeatable depth control that is easily adjustable. Not every producer agrees on how to make it. 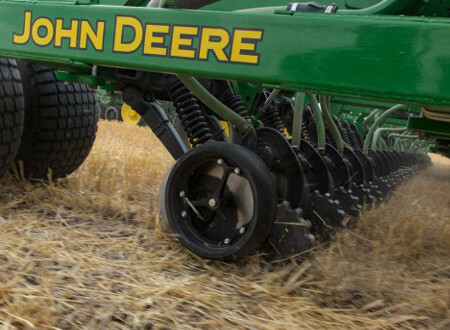 That is why John Deere provides a choice of two depth control options on the 1830 and 1835. Immobilization, or the uptake of nitrogen by microbes breaking down residue. Denitrification is the conversion of nitrate (NO3) to nitrite (NO2), and eventually to N2 or N2O (nitrous oxide). 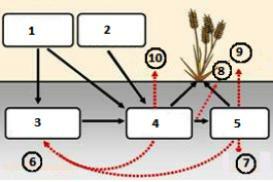 These nitrogen forms are not held by the soil complex like NO3 and NH4 and are subject to escape via water. Plus, application at seeding means no more worrying about pre-season nitrogen loss due to de-nitrification and leaching. Reduce dependence on risky top-dress applications where volatilization and immobilization can significantly reduce crop uptake. Fertilizer can now be applied in the seeding operation with confidence, knowing it is firmly in place where it belongs in the soil. 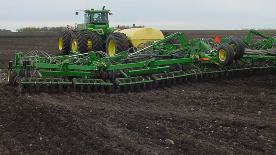 John Deere seeding group thinks sound nitrogen management should be rewarded. That is why the 1835 SFP Air Hoe Drill was designed with the exclusive SFP opener to place nitrogen, potassium and sulfur-based fertilizers separate from the seed. This positive separation of fertilizer and seed eliminates seedling damage caused by some fertilizer forms and application methods. 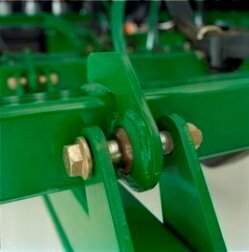 When seeding with the 1835 SFP, the seed opener will have an effect on the distance between the seed and fertilizer. 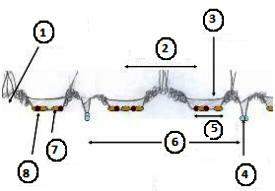 For example, as the diagram above shows, seeding with a 10.2-cm (4-in.) spread places the seed between 20.3 cm (8 in.) and 30.5 cm (12 in.) from the fertilizer in the same furrow. The United States Department of Agriculture (USDA) data suggests spring wheat producers who apply nitrogen at seeding typically cut their application rates by 15 percent when compared to pre-seeding applications. This is driven by the reduced risk of environmental loss. Fertilizer inputs can represent 30 percent to 35 percent of the cost in small grain and oil seed production. It is no wonder farmers are concerned about nitrogen losses from gas escape, volatilization and leaching. There is no more worrying about pre-season nitrogen loss due to denutrification and leaching. 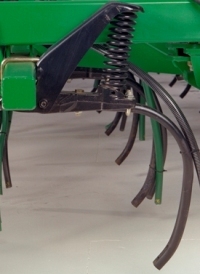 Operators can forget about volatilization of top-dress applications, and maybe most notably, endure a day of seeding without the burning nasal passages that accompany poor anhydrous ammonia retention. 2.5-cm x 30.5-cm (1-in. x 12-in.) 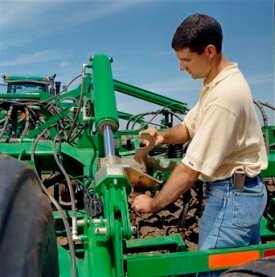 cast closing wheel follows the press wheel to close furrow, placing soil over seed or fertilizer after the press wheel secures seed in furrow. Down pressure is adjustable from 12 kg to 19.5 kg (26 lb to 43 lb) (no tools and three adjustments). That is how John Deere's TruPosition standard may be described. 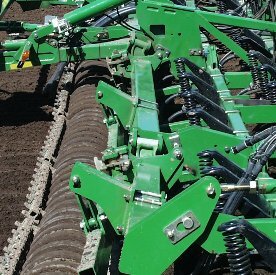 When the seed depth consistency and row spacing integrity are top concerns, this low-maintenance design will not compromise. It has a 51-degree shank. Disturbed soil packed over seed row with 14-cm (5.5-in.) semi-pneumatic packer. 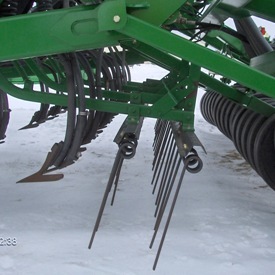 The seeding profile behind an 1830 equipped with a harrow and sweeps will look similar to the image on the left. A flat seed floor with seed distributed over 50 percent of the row spacing for 25.4-cm (10-in.) 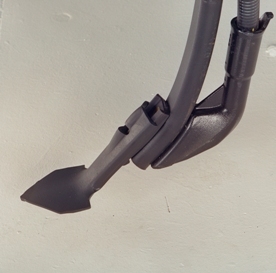 configurations using the Perma-Loc™ boot and sweep. The knife bodies are available in 2.5 cm (1 in.) or 10.2 cm (4 in.) spread points. Use the 2.5-cm (1-in.) 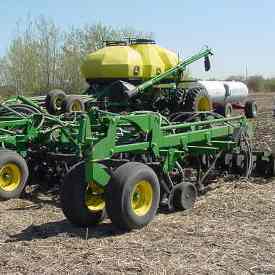 point for low disturbance or, if a wider spread pattern is desired to increase seedbed utilization, use the 10.2-cm (4-in.) point. 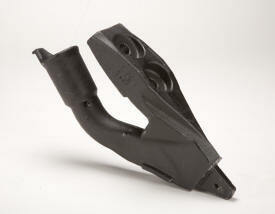 The points can be quickly changed with a single roll-pin fastening system and feature carbide tips to ensure long life. 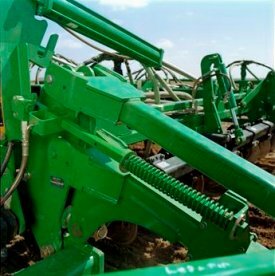 Perma-Loc spoons and sweeps from John Deere offer reduced maintenance because the Perma-Loc design enables a change-out up to five times faster than traditional bolt-on components. 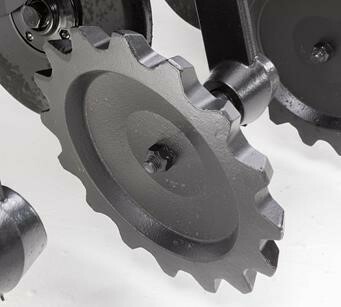 They also offer cost savings because with Perma-Loc spoons and sweeps, there is no more purchasing hardware each time spoons are changed out. 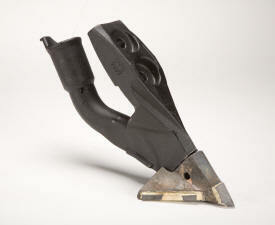 This can save $309 USD list price when changing out the spoons on a 18.3-m (60-ft) tool with 19-cm (7.5-in.) spacing. Shown is the 10.2-cm (4-in.) Perma-Loc spoon; 7.6-cm (3-in.) spoons are also available. 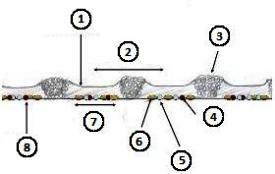 Below is the seedbed profile that can be expected if using a 10.2-cm (4-in.) 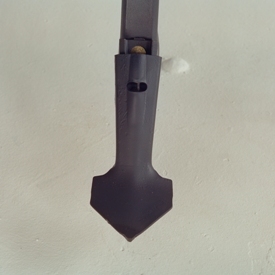 spoon in conventional tillage with the 1835 Separate Fertilizer Placement (SFP). The 25-mm x 305-mm (1-in. x 12-in.) 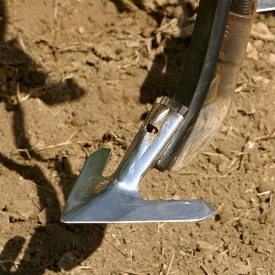 cast closing wheel follows the press wheel to close the furrow, placing soil over seed or fertilizer after the press wheel secures the seed in the furrow. Includes a spare tire, wheel and tire mounting bracket.